Click Lake James for results. 1st Place: In 2013 Ron Fabiszak and Ron Nelson won three tournaments in a row. 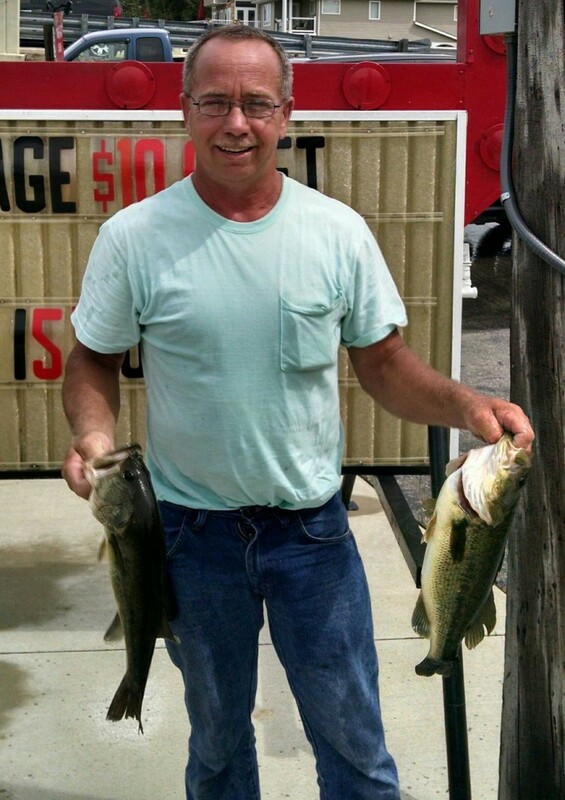 Never before or after has a team won two consecutive R & B Bass Circuit tournaments. That is until now. Enter Jim Wheeler and Ray Smith. 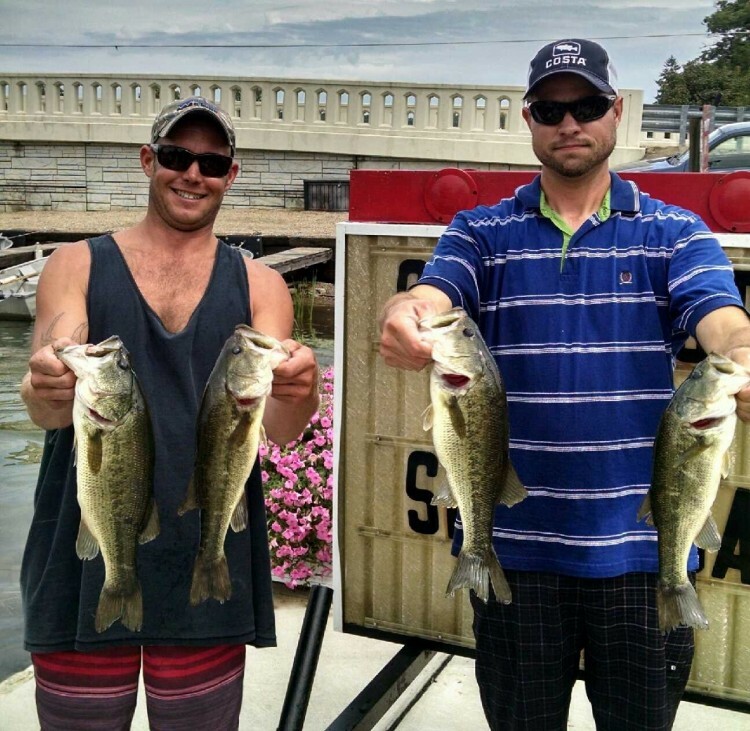 The duo have won the last two West Division tournaments: first Lake Wawasee and now Lake James. Welcome to a distinguished club, gentlemen. For the reader, that’s just the tip of historical achieving iceberg. Historically speaking, their plight to victory at James may also go down as the most unique as well. One cannot make this stuff up. in practice. After failing to connect with any of them, a pre-tournament decision by Jim began working its way downstream, and we can all be reminded that sometimes it is necessary to unload in order to load up. Before take off, Jim bought a dozen donuts from Tom's Donuts across the street and shared them with others, “Apparently I had one too many,” he admitted, “because, suddenly, I had to use the bathroom right away.” They raced to a nearby ramp, and while Jim was unloading, Ray noticed the clarity of the water in that area was the best they had seen anywhere else. Instead of heading back to their starting spot, they stuck around and loaded the boat. The area went on to produce six keepers over the next four hours. “Hey, sometimes [stuff] pays,” quipped Wheeler. 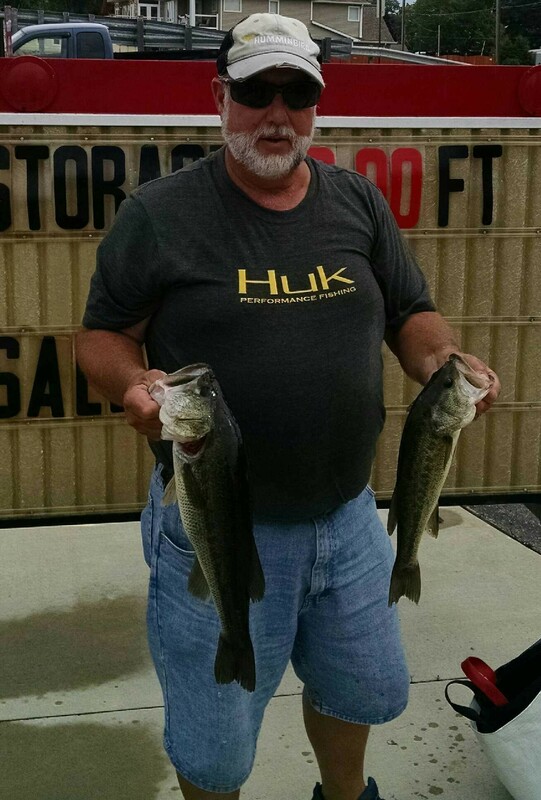 Three keepers were caught with a black/blue homemade jig around boats and docks, while two others were caught with a frog over lily pads. One more was added with a chatterbait between docks. Reminiscent of Wawasee, they again made a critical upgrade in the final minutes. 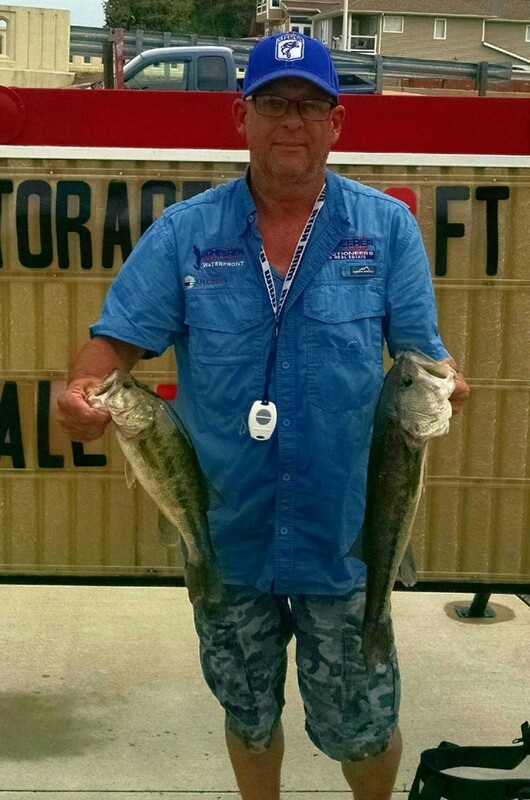 An 11.14 pound limit awarded them $580 and a Rod Bender Baits certificate, but their bag also included the biggest bass of the day, a 3.78 pound largemouth, which earned them another $208. This made their day worth $788. The consecutive victories also catapulted them into the Top 5 of the Standings. It just goes to show that one should always fish the moment, and to never deny a call from Mother Nature. She just might be trying to help you load the boat. 2nd Place: It comes as no surprise to see Bear Griva and Mike Klavinski compete for another victory on Lake James. They won the event in May 2014, notched a Top 5 this past May in the East Division, and countless other victories on this chain make them perennial favorites. A 10.44 pound limit, one of just three weighed, scored them $311 and helped solidify their prowess even more. even saw one fish with its back out of the water!” professed the Bear. A finesse approach, weightless worms, accounted for five of the six keepers they caught, while the lone other bit a jig flipped by a boat dock. They had their limit by 9:00, but were not able to upgrade until the final 30 minutes when they made a 1.5 pound cull with the worm. 3rd Place: With the distinction of being the winners of the East Division tournament on Lake James under their belt, Doyle Randol and substitute partner Joe Miller made their first showing with the West Division. West members now know what the East has had to put up with. They captured the only other limit of the tournament. Like those above them the 8.59 pound limit was plucked from shallow water, but their choice to target shallow water was determined after a thorough practice. “Joe practiced breaklines and deeper water one day, while I practiced shallow,” explained Randol, “and it was clear that shallow was the way to go.” Their instinct was confirmed shortly after the tournament began. “Our first cast of the tournament produced our biggest fish of the day (2.54 pound largemouth), and we had our limit by 9:00,” revealed Doyle. 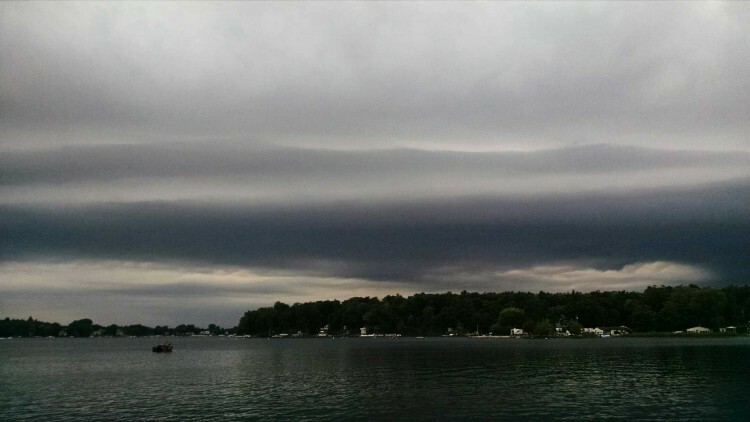 They split their time on Jimmerson Lake and all three basins on Lake James; unfortunately, they were never able to upgrade their initial limit. Regardless they still took home $203. 4th Place: While Damon Woodard and Carl Piper will not be complaining about their first Top 5 of the season, Lake James will still end up being the tournament that “could have been.” Two lost fish, both three pounds, one on a drop shot and another on a swimjig, will haunt them for a while. Still the four fish they weighed went 7.31 pounds and won them $162. Pivotal decision making led to their success. They began in front of Pokagon State Park, but quickly determined they were in unproductive water, and gambled on a nearby channel. At the mouth they bagged their first keeper on a Zoom Centipede. From there they drove all the way into Otter Lake and caught two keepers shallow with swmjigs and a fourth in deeper water with a drop shot rig matched up with a Zoom Speed Worm. 5th Place: Kevin Rathke and Don Amari scored their third Top 5 of the season, including two in a row with the West Division. To their amazement, it only took three fish to secure this Top 5, but that small bag of fish included the second largest fish of the day: a 3.48 pound largemouth. 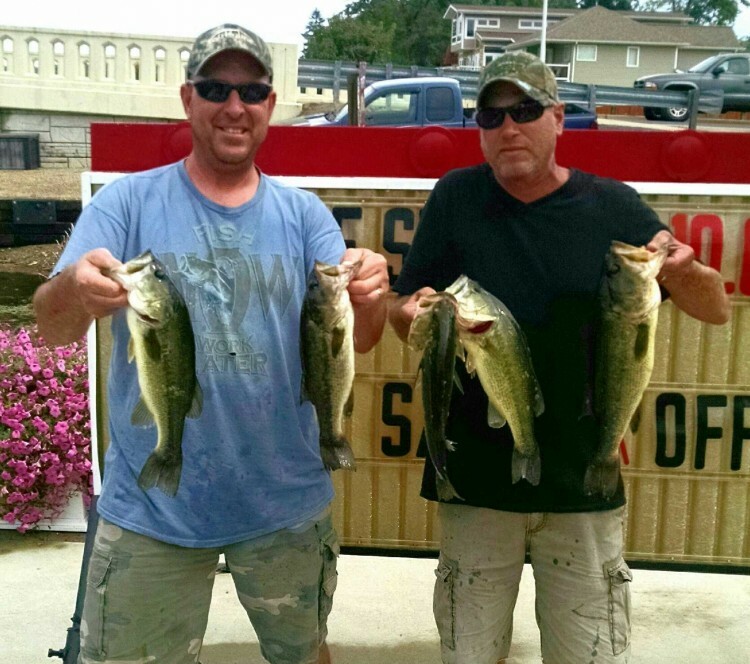 That fish won them $52, but their 6.62 total weight gave them another $95. Rathke described their plan as, “Going in and out,” by repetitively fishing shallow water, moving into deep water, then repeating. Two of their keepers were tricked with jigs under moored boats, and another from a Zoom Critter Craw. However, it was Rathke’s wits that kept them in the game. “We noticed that our livewell was not working,” he recalled, “so I had to get creative and rewire the bilge pumps to work as livewell pumps.” Unfortunately, problems persisted. “Then we lost all power to the boat! After going through all of the wiring in the downpouring rain, I determined the main circuit had gone bad.” Rathke “MacGyvered” the wiring in order to the conserve the fish and finish the day. A bag of largemouth weighing 6.33 pounds by Steve Prange and Josh Stalcup won them a tackle pack provided by Rocky Brook Sinkers. Tim Pugh and Dan Truex brought one fish weighing just 1.02 pounds to the scales to win a $25 gift certificate redeemable at Schnelker Marine or online.